Over the past few years, Middle East construction equipment market revenues declined majorly due to sluggish demand from construction sector. Fall in the price of crude oil has led to several large-scale construction projects being halted or cancelled as a result of reduced government expenditure, thereby affecting the demand for construction equipment negatively. However, with the recovery of oil prices, growing construction sector on account of increased infrastructure spending in UAE and Qatar for upcoming events such as Dubai Expo 2020 and FIFA world cup 2022 would further drive the growth of construction equipment market in the Middle East region. According to 6Wresearch, Middle East Construction Equipment market size is projected to grow at a CAGR of 1.8% during 2018-24. Government initiatives such as Saudi Vision 2030, UAE Vision 2021 and Turkey Vision 2023 would spur the demand for construction equipment market in the Middle East region. These initiatives include expansion of metros and airports, along with the construction of new hotels and shopping malls, which would boost Middle East construction equipment market forecast revenues. The construction application segment is expected to demonstrate significant growth over the coming years owing to large number of upcoming infrastructure projects in the region. Additionally, mobile cranes and earthmoving equipment captured major pie in the overall Middle East construction equipment market share due to their extensive usage at construction sites for excavation and lifting heavy weights. The Middle East construction equipment market report comprehensively covers the market by types, applications and countries. 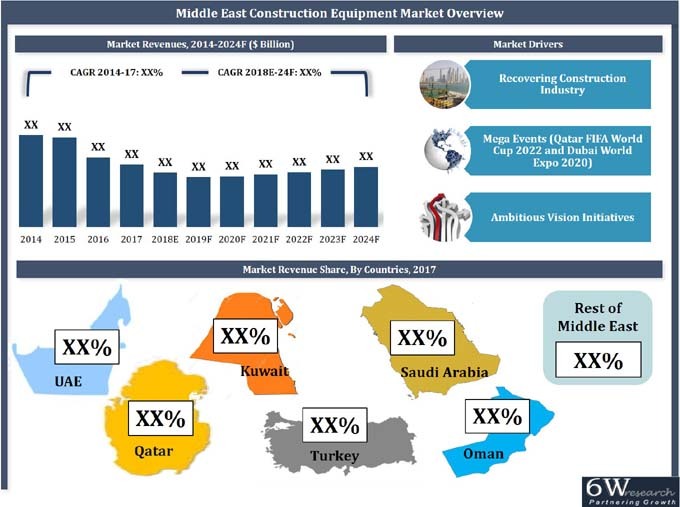 The Middle East construction equipment market outlook report provides an unbiased and detailed analysis of the on-going Middle East construction equipment market trends, opportunities/high growth areas and market drivers which would help the stakeholders to device and align their market strategies according to the current and future market dynamics. •	Middle East Construction Equipment Market Overview. •	Middle East Construction Equipment Market Outlook. •	Middle East Construction Equipment Market Size and Middle East Construction Equipment Market Forecast until 2024. •	Historical Data of Middle East Construction Equipment Market Revenues & Volume for the Period 2014-2017. •	Market Size & Forecast of Middle East Construction Equipment Market Revenues & Volume until 2024. Revenues & Volume for the Period 2014-2017. Market Revenues & Volume until 2024. Revenues, By Applications for the Period 2014-2017. Market Revenues, By Applications until 2024. Revenues & Volume, By Equipment Types for the Period 2014-2017. Market Revenues & Volume, By Equipment Types until 2024. 14.7 Doosan Infracore Co., Ltd.
14.8 Xuzhou Construction Machinery Group Co., Ltd.